QUEZON CITY – After almost two years, cultural worker Ericson Acosta is now free to write poems and songs outside prison. The Department of Justice (DoJ) today released a favorable resolution to Acosta’s Petition to have his criminal case reviewed. His Petition for Review was filed at the DoJ in September 2011. Acosta was arrested in San Jorge, Samar in February 13, 2011 on suspicion that he is a member of the New People’s Army – just because he carried a laptop. He was falsely charged with illegal possession of explosives at the Gandara Regional Trial Court. Last January 17, the Gandara RTC granted Acosta temporary release to undergo medical check-up, confinement and treatment at the National Kidney Transplant Institute in Quezon City. The Gandara RTC, Branch 41, granted the said motion on the same day. “The unwarranted arrest and torture torment political prisoners each day they remain in prison. 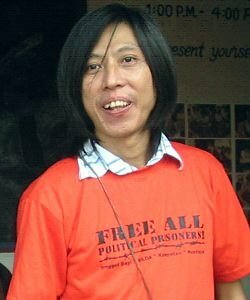 Political prisoners are rendered de facto ‘criminals’ and ‘terrorists,’ deprived of due process, forced to be at the mercy of the military. This injustice has to end.” Acosta said. Acosta’s Petition for Review cited irregularities and human rights violations in the conduct of his arrest and detention cited in the petition for review, namely, 1) he was arrested without warrant while not committing any crime or doing anything illegal; 2) he was not informed of the reason for his arrest at the time of his arrest; 3) he was denied the right to counsel; 4) he was denied a phone call and prevented from contacting his family or lawyer; 5) he was subjected to prolonged interrogation for 44 hours; 6) he was physically and psychologically tortured during tactical interrogation; 7) he was deprived of sleep, threatened, intimidated, coerced and forced to admit membership in the NPA; 8) the grenade subject of the case was planted; 9) the complaint against him was filed in court only after 72 hours and 30 minutes; and, 10) he was detained in a military camp, which is not of civilian jurisdiction. The Free Ericson Acosta Campaign rejoiced at the DoJ’s decision and held a short program outside NKTI. The group said that a solidarity event is to be held in the next few days in support of all political prisoners in the country. The campaign to free Ericson Acosta has been sustained for almost two years, gaining widespread local and international support from prominent artist and human rights organizations such as the Amnesty International, PEN International, Campaign for Human Rights in the Philippines in the United Kingdom, Canada and New Zealand, INTAL-Belgium, The International Conference for Progressive Culture-People’s Art Network, BAYAN, SELDA, UP Diliman University Council, Concerned Artists of the Philippines and even members and officials of the state’s National Commission for Culture and the Arts (NCCA). On November 2011, Acosta was named finalist of the Imprisoned Artist Prize at the Freedom to Create Awards Festival in Cape Town, South Africa, along with other nominees from Myanmar and Tibet. Acosta said, “In jail, I yearned for sea and sky. Freedom cannot be achieved by mere yearning, only by struggle. VILLABA, Leyte – The provincial government of Leyte, through the Comprehensive Local Integration Program (CLIP) had once again dispensed reintegration funds to former members of the New People’s Army. 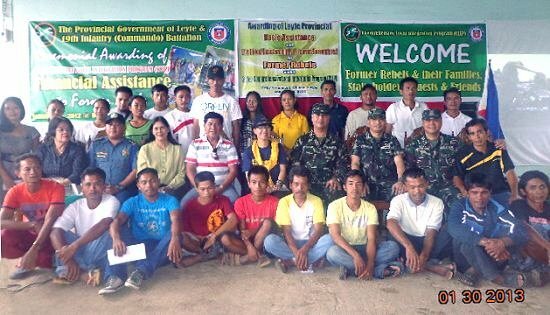 This was the highlight of the Ceremonial Awarding of Financial Assistance to 28 Former Rebels held at Brgy. Cagnocot, Villaba, Leyte on Wednesday morning, January 30, 2013. Each former rebel received P10,000.00 worth of pre-surfacing assistance while another P25,000.00 were also given to five of them (former rebels) who surrendered with firearms. Lt. Col. Joel Alejandro Nacnac, commanding officer of the 19th Infantry Battalion based in Brgy. Aguiting, Kananga, Leyte confirmed that the recipients of the provincial assistance were former members of the Front-Committee Leyte (FC-L) which the military battled for several years. In his message, Col. Rafael Valencia, area commander of the military in Leyte urged the recipients to set as examples and encourage their former comrades to return to the folds of the law and avail the programs in store for them. Col. Valencia furthered that the assistance received by the former rebels is just the start of the new life and brighter future that lies ahead of them and their respective families. Meanwhile, Gov. Ma. Mimietta Bagulaya expressed his gratitude to military, police and other government agencies who worked hand in hand in the implementation of the Comprehensive Local Integration Program. Bagulaya also commends Provincial Social Welfare and Development Officer, Mrs. Clotilde Malatbalat and third district board member Hon. Rolando Piamonte who were equally instrumental to the success of the event. Bagulaya who was guest of honor and speaker of the ceremony was impressed with the courage of the former rebels who shall once again surface in their respective community. “The battle that we must fight and unite for is poverty”, Gov. Bagulaya stressed. QUEZON CITY – The Concerned Artists of the Philippines welcomes the Department of Justice's (DOJ) new resolution to withdraw charges filed against Ericson Acosta, a poet, activist and former editor of the Philippine Collegian of the University of the Philippines. Acosta was arrested on February 13, 2011 in San Jorge, Samar by the military. He was subsequently interrogated, tortured, jailed, and falsely charged of illegally possessing explosives. Acosta spent 23 months in the Calbayog sub-provincial jail and was recently allowed to be confined at the National Kidney and Transplant Institute in Quezon City. Earlier today, the DOJ issued a resolution granting Acosta's petition for review, reversing probable cause and dismissing the military's trumped-up chages against him. “We welcome the DOJ's move to free the artist. This victory is the result of a long and persistent struggle by Acosta's family, friends, fellow activists, artists and human rights advocates against such political persecution and suppression. It affirms that the military has erred in bringing on false charges and violated basic human rights,” said visual artist Renan Ortiz, spokesperson for CAP. Despite the good news, Ortiz added, many other political prisoners who have met the same fate as Acosta continue to languish in jail. Human rights groups have listed over 300 political detainees suffering under the Aquino administration. “We must also note that many other cultural workers and artist-activists remain imprisoned for years already under the current administration. These include Alan Jazmines, an activist, poet, and painter; UP film student Maricon Montajes; union organizer and writer Randy Vegas – who like Acosta are all detained based on trumped up charges, harassed and persecuted because of their activism,” Ortiz added. In support of the call to free the artist and free all political prisoners, CAP will be organizing a global event for people's rights entitled Artists Break the Chains: Global Action to Defend People's Culture on February 20, 2013 at the Freedom Bar in Anonas, Quezon City. MANILA – Vice President Jejomar C. Binay denied the allegation of Senator Franklin Drilon that the United Nationalist Alliance (UNA) is out to make President Benigno Aquino III a ‘lame duck’ President. In an interview at the sidelines of the Global Organization of Parliamentarians Against Corruption (GOPAC), Binay assured that UNA remains supportive of Aquino’s “daang matuwid” and reform agenda. “Paanong lame duck e nandiyan ang suporta namin?” the Vice President said. “We are the new opposition – an opposition who will be supportive of matters which the President is undertaking tapos tutulong kami kung kailangan magdagdag kami ng suggestions sa kanilang mga panukala. Pero hindi namin bibitawan na ibunyag, ipaabot sa mamamayan ang maling nangyayari,” he added. Binay noted that some quarters are just trying to create a wedge between him and the President. “Talagang iniintriga ang samahan naming dalawa ng Pangulo. Ewan ko kung ano ang purpose nila para kami ay pag-intrigahin. Wala naman kaming dapat pag-intrigahan,” he said. “I think the President was clear in his statement. Wala naman kaming pinagdaanang diperensya and he is satisfied with the manner by which I am working,” he added. Earlier, Aquino told reporters at the end of the World Economic Forum in Davos that he does not have any “issues” with the Vice President. Meanwhile, Binay downplayed claims of administration officials that UNA is taking advantage of the President’s popularity to boost the chances of its senatorial candidates in the coming elections. “In the first place, mataas din naman ang aking survey, lalo na pag pinagsama mo ang survey ni Jojo Binay, at tsaka ni Senator Enrile, tsaka ni President Erap, kaming mga UNA leaders” the Vice President said. DAVAO CITY – The Senate should respect the Constitution’s designation of the Commission on Audit (COA) as the sole body to review government finances including that of the Senate, Sen. Chiz Escudero told Davao newsmen. Escudero voiced the position amid Sen. Alan Peter Cayetano’s proposal for a parallel audit of Senate funds to be conducted by COA and a private auditing firm. Cayetano’s proposal was an offshoot of allegations on Senate President Juan Ponce Enrile’s supposed misuse of Senate funds when he distributed additional maintenance and other operating expenses (MOOE) allowances for senators prior to the Christmas holiday break in the Senate. Escudero said, however, that a clear accounting of the funds given to senators should be made instead of the current practice in the Senate of liquidation by certification. “I'm in favor of COA opening all the books of the Senate but not the proposal to have a private firm doing an audit. There are legal considerations that should be followed,” Escudero said. The constitution provides that COA will have sole authority in auditing government funds and senators cannot order COA, an independent constitutional body, to audit specific funds. The COA is similar to the Commission on Elections and the Civil Service Commission which cannot be dictated on by members of the Senate on the actions that it can take. PASAY CITY – Senate minority leader Alan Peter Cayetano filed a resolution (P.S. Res. No. 934) calling for the Senate to lead by example, by authorizing the conduct of a people’s audit or a joint or parallel audit of its budget accounts by a private and independent auditing firm and the Commission on Audit (COA). This audit comes with a mandate to examine all of the Senate’s pertinent documents, for the purpose of increasing the level of transparency and accountability in governance, thereby strengthening the integrity of the institution. The senator did this in light of the recent events that have aroused public interest and generated a lot of reactions and issues on the utilization of public funds thereby casting doubt upon the integrity and credibility of the Senate as an institution. “A people’s audit or a joint or parallel audit that is open to the public involving a private and independent firm and the COA addresses the growing uncertainty as regards to the credibility and integrity of the Senate as an institution,” he said in his resolution. He recalled how Senate President Juan Ponce Enrile’s distribution of P1.6 million to 18 senators and P250,000 to the remaining four including the minority leader under the guise of additional maintenance and other operating expenses (MOOE) funds has opened the question on whether or not such a disbursement from the Senate President’s discretionary funds is legal. “Among the issues sought to be answered are: (1) How was the P250,000 released to all the Senators reported or liquidated by the Senate President, and (2) From the P2 billion Senate budget for 2012, how much was liquidated by certification alone,” he said. The minority leader explained that in line with the current administration’s thrust of transparency, accountability and good governance reform in its “daang matuwid”, the public’s right to know how their taxes are utilized must be upheld. “The Senate’s response must not be limited to its passage on third reading of SB 3208 or the Freedom of Information (FOI) Bill but rather through concrete action,” he said. Cayetano also reiterated his argument that there is no legal impediment in allowing the joint or parallel audit by the people and/or a private auditing firm with the COA. He concluded that given that the Senate is among the most credible government institutions, it is not only mandated to deliberate on and pass appropriate laws, conduct investigations in aid of legislation, act as impartial judges in impeachment proceedings of corrupt public officials but also to live by example as being trustworthy and accountable to the people, serving them with utmost responsibility, integrity, loyalty, and efficiency. “The Senate could not now claim to credibly investigate other offices and individuals when it is perceived to be less transparent and accountable within its ranks with regard to how it allocates, disburses and liquidates its MOOE and other funds,” he said. CAMP KANGLEON, Palo, Leyte – What is supposed to be a simple violation of the Helmet Law turned into a drug bust when two riding-in-tandem suspects were arrested by the police for possessing illegal drugs and paraphernalia. Eastern Visayas top police official Police Chief Superintendent Elmer Ragadio Soria said that his men were just implementing the Police Integrated Patrol System (PIPS) when they saw the riding-in-tandem suspects who were not wearing protective helmets. The duo, Melvin Villassin, 29, single of Mariveles Compound, Brgy Felipe, Ormoc City and his backrider Raymundo Castro, 29, married, lotto teller residing at Isla Verde, District 26, Ormoc City were accosted by PO1 Jonas Etis and PO1 Sergie Sabuya at the corner of Ebony and Juan Luna Streets, Public Market Compound in District 1, Ormoc City while the policemen were conducting roving patrol on Friday afternoon. “The police officers approached the two for the Helmet Law violations but they noticed Castro nervously holding a blue plastic box and a tin foil,” Soria informed. Suspecting that the subjects were in possession of illegal items, the police officers requested assistance from Brgy. Chairman Jerome Manago and Brgy. Kagawad Ramel Dafon and called Police Station 1 of Ormoc City Police Office on the matter and in turn contacted media man Roberto Dejon and Ms. Rita Pidoy of the Department of Justice. Castro was requested to open the plastic box in the presence of above witnesses wherein it was found out that the box contained a transparent heat-sealed sachet containing white crystalline substance suspected to be “shabu”, 16 pieces cut tin foils and 2 lighters. The suspects were immediately brought to the police station for further investigation while the confiscated items were brought to the crime laboratory for examination. Appropriate charges are being prepared against them. "The public should be vigilant against the modus operandi of these riding-in-tandem suspects since recent crime incidents in the country involve motorcycle-riding criminals including transporting illegal drugs,” the regional director added. The Helmet Act of 2010 or RA 10054 strictly requires motorcycle riders, including drivers and backriders, to wear standard motorcycle helmets while riding in any type of road or highway. Said helmet shall pass with the specifications of the Department of Trade and Industry (DTI) to include the Philippine Standard (PS) or Import Commodity Clearance (ICC) under the DTI-Bureau of Product Standards’ (BPS) Product Certification Scheme. TACLOBAN CITY – The search for the first-ever Global Telecentre Awards, was recently launched by the Spark (the 4th Global Forum on Telecentres) and Telecentre.org Foundation organizers in order to recognize the best players in the international telecentre arena. The Search also aims to encourage the best players in international telecentres to continue raising the status of excellence in the delivery of ICT-based services to the communities, according to the Philippine Community eCenter Network which led by chairman Dr. Angelo Juan O. Ramos. The Search has five categories, namely, Telecentre, Telecentre Manager, Telecentre Network, Telecentre Intiative, and Telecentre Innovation. A special award, the Global Community’s Choice Award, will be chosen by TCF community members in a month-long voting process. The Best Global Telecentre Award shall recognize the best performing telecentre in the global telecentre movement. The specific areas that will be looked into include innovation, sustainability, content and services, and community impact. This award shall highlight the telecentre that has proven to be most successful in strengthening its operations, offering high quality and diverse content and services, and implementing innovative and creative solutions, making it more relevant to the community it serves. The award will cite the telecentre that has been operational for at least 2 years and has made the greatest and most positive impact to the community it serves, where the lives of people have significantly improved as a result of the telecentre’s presence. The second category, the Best Global Telecentre Manager Award shall be given to the telecentre manager who has demonstrated exemplary leadership and initiative in managing the telecentre, steering it towards growth and innovation that positively impacts the community it serves. The individual should have at least one year residency as manager in the same operational telecentre. Meanwhile, the Best Global Telecentre Network Award shall pay tribute to the network of telecentres that has not only emerged as a sustainable entity but has also managed to create an enabling environment for the telecentres under it, facilitating knowledge exchange among them, building their capacities, and making them self-sufficient, thereby enabling them to contribute to the attainment of the ultimate goal 1st Global Telecentre Awards Guidelines of digital inclusion. Only networks below the regional level shall be eligible for this award. Moreover, the Best Global Telecentre Initiative Award shall honor the organization that has successfully implemented a telecentre-related initiative and has supported and directly benefited a minimum of 10 telecentres. Such initiative must have been in place for at least two years as of nomination date and must have clear and concrete evidence of success, thereby making a valuable contribution to the global telecentre movement. The criteria for this shall include the community empowerment value of the initiative where both the telecentre and the telecentre users are working together. Finally, the Best Global Telecentre Innovation Award seeks to recognize the most innovative telecentre solution introduced. It enables solution providers and telecentre and ICT4D project implementers the opportunity to showcase new innovations that expand opportunities for telecentres to become more sustainable. It could be any product, service or concept that represents innovative development and addresses a specific need. All the award categories put premium on the 3 important aspects of the global telecentre – Movement, People, Innovation and Sustainability, which are also the 3 main themes of the upcoming SPARK (the 4th Global Forum on Telecentres) event. All registered members of Telecentre. Org’s online communities may participate in this international search. Entries will be accepted until February 28, 2013. The winners shall receive a Certificate of Recognition, plaque, travel grant of up to US $2,500 to attend the awards ceremonies, waived conference fees for the Spark event, and visibility in TCF’s corporate and community websites and online communication channels. The Global Community’s Choice Awardees, on the other hand, shall receive a Certificate of Recognition, a plaque, and exposure in TCF’s corporate and community websites and online communications channels. Awards will be given on May 28, 2013 at the Spark event in Granada, Spain.